When you think of Scotland, what is the first place that comes to mind? I’d say most people would say Loch Ness, right? It was certainly what I thought of the first time I considered visiting the country. But it took 3 trips to Scotland before I actually took a day trip to Loch Ness. 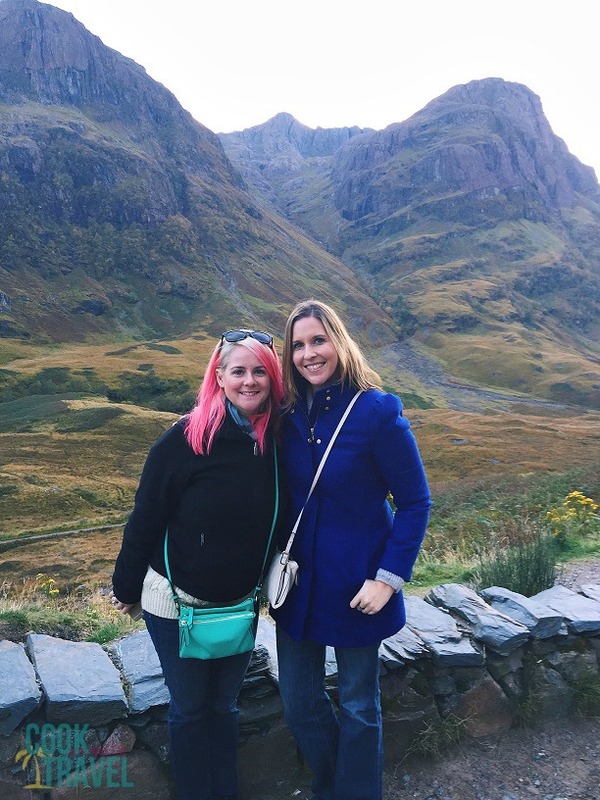 Day two of our Scottish day tripping was our longest as we rode the tour bus up to the Highlands including Inverary, then Loch Ness, Ben Nevis, and Glen Coe. It was a day packed with big landscapes and adventurous stories. As you can imagine, this particular tour is a very popular one. (We are all hoping to catch a glimpse of Nessie in our lifetimes, are we not?!) We had 28 people on our tour, which is a number I’ll easily remember as Gary, our tour guide, did a head count at every stop. It was the largest group of our 3 tours, but still fairly manageable. We departed from Edinburgh bright and early (well early at least), and started the long trek up to the Highlands. Well it wasn’t really all that long, but we didn’t have many stops getting there so it seemed a bit longer. It’s a really gorgeous drive as you see the landscape become much more rugged with large mountains and sweeping valleys. The first stop was an adorable Highland town of Pitlochry. I wish I’d gotten some photos but we were on a mission to get food for lunch and make it back to the bus in plenty of time. It’s a picturesque little stop with shops and restaurants lining the main street! So quaint and cute! Here we are driving through Cairngorms National Park on our way to Loch Ness. We drove through the Cairngorms, which is a national park and is packed with lovely scenery. It’s certainly spot that every outdoorsy person would love! The northernmost point of the Highlands that we saw in Scotland was as we drove through Inverness. Inverness sits on the River Ness and is much more of a bustling city than I expected. 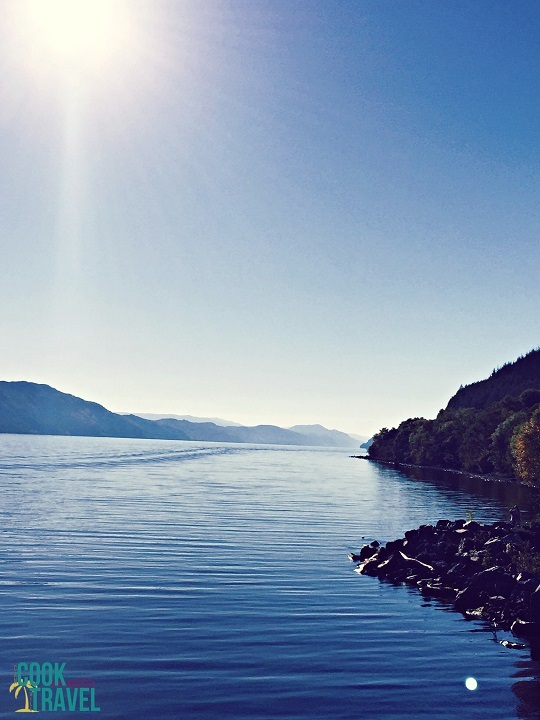 A serene (Nessie-free) day on Loch Ness. Beautiful! All of the lochs (aka lakes) in Scotland are connected. 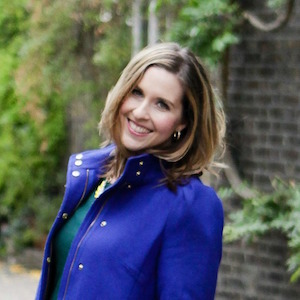 Bundle up for the Highlands. We brought hats and scarves, and had warm coats, layers, and gloves. It can certainly be chilly, as the locals in Edinburgh warned us. 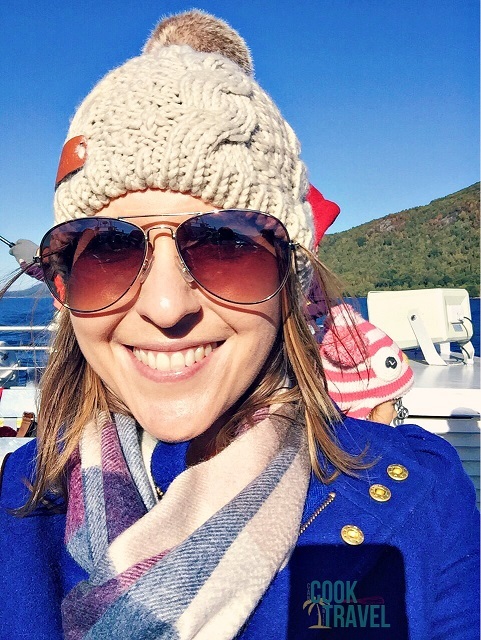 Here I am aboard the boat cruise around Loch Ness … it was cold but at least I got this great hat and scarf out of it! Loch Ness is 23 miles long and 1000 feet deep, which means that Nessie could TOTALLY live there. Although she was a bit shy when we were at the loch. All of the water in England and Wales wouldn’t be enough to fill Loch Ness (or a few other lochs in Scotland). Pretty cool! Vikings used to sail down Loch Ness. I rode on the boat and imagined what that would look like, and it was pretty mind blowing. There is a ruined castle overlooking the loch called Urquhart Castle … I found it particularly interesting that there were people paddleboarding by the castle in the chilly loch. Brrrr. How cool is it that these people are paddle boarding on Loch Ness? It’s a little too chilly for me to have thought to do that! Once we left Nessie behind, we headed to some even bigger scenery. We made a quick stop at a neat World War II memorial before we made our way to Glen Coe. Scenery at Glen Coe is unbelievably stunning. This photo just doesn’t do it justice! A glen is a term the Scots use for a valley. Glen Coe is pretty stunning. And as we stood in the glen looking up at the large mountains of the Highlands (still fairly small compared to the mountain ranges we see in the States), it seemed that our rather talkative tour group became quiet (once the photos and selfies had been taken of course). We spread out and explored and took in the beauty. Photos simply cannot do the setting justice. It’s green yet rocky and smooth yet jagged. And while it’s a peaceful place now, you can almost hear the bloody battles of the Scottish clans fighting many centuries ago. The most famous is that of the massacre of the MacDonald Clan. Crazy to believe a place so beautiful saw such terror. A quick note on Ben Nevis, is that it’s the highest mountain in Scotland. 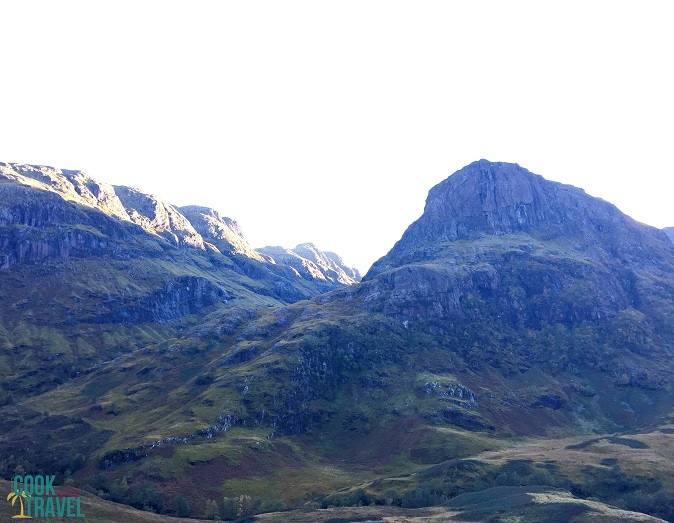 We didn’t stop but drove by on the bus, but it certainly continued to echo the big landscapes we saw at Glen Coe. And then we headed back to Edinburgh and the 12 hour tour was over. We were exhausted, but it was a cool day. 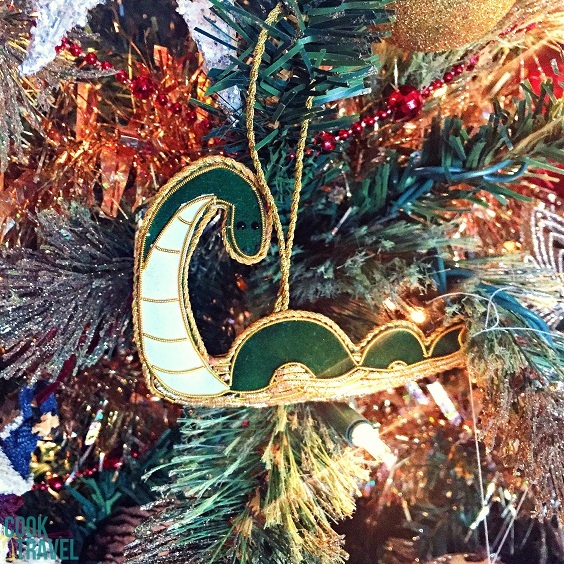 We had to get a couple of Nessie ornaments for our Christmas trees, since we didn’t actually see her … this time. Nessie is right at home on our Christmas tree this year. 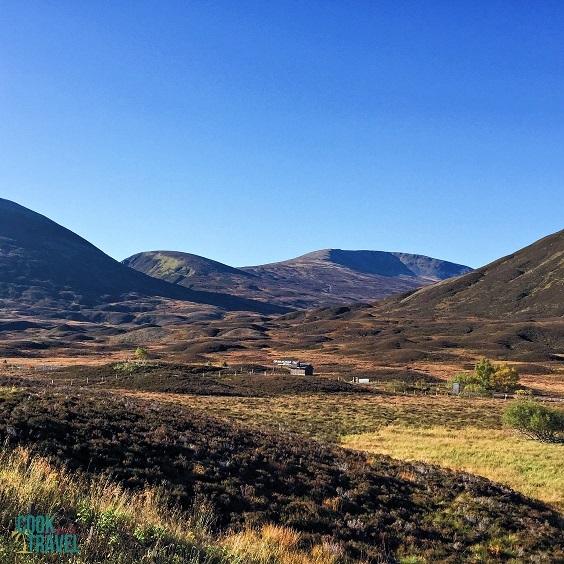 This tour is for you if you love landscapes and want to see some iconic Scottish areas. And you should, as it’s quite lovely. Our tour guide was fun, played fabulous music, and shared the history throughout the tour, which made a longer tour go by quite quickly. 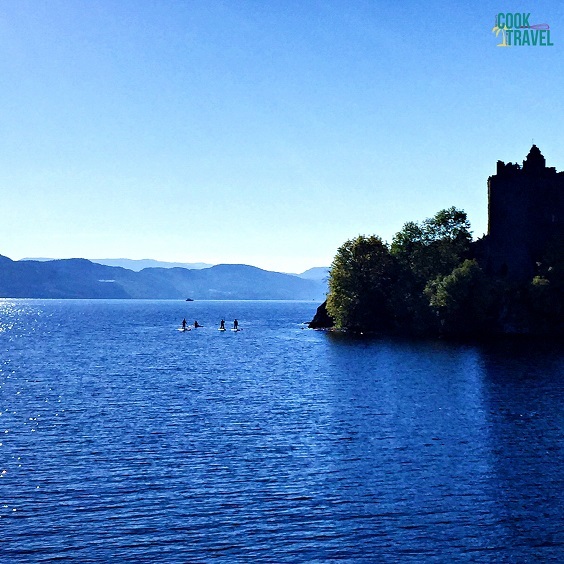 I hope you enjoyed reading a bit about our day trip to Loch Ness. Certainly try to fit in one of your own on your next trip to Scotland. 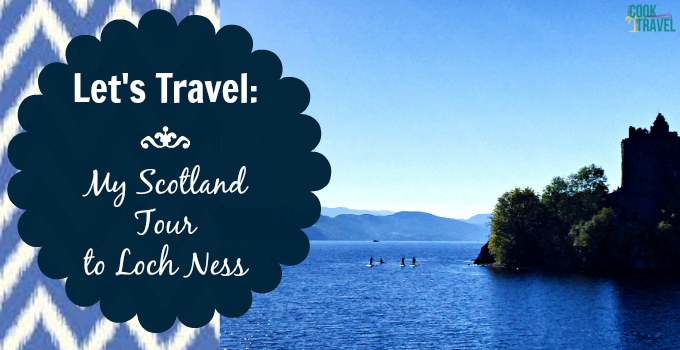 Stay inspired & go hunt for Nessie at least once in your life!